The writings, stories and art of 8 spiritual communities in South Australia, with expert commentary from educators and spiritual leaders. The Golden Rule - Love thy Neighbour - is a value shared by all major faith groups. By acknowledging our common humanity we can work together to build a more peaceful and tolerant world. The first of its kind in Australia, the exhibition was supported by the Australian Government and Adelaide City Council. The event was opened by Governor of South Australia Hieu Van Le AO and City of Adelaide Lord Mayor Martin Haese. Curriculum supportive intercultural understanding resources were developed with this project and are available for download or browsing below. Images and videos of the artists & artists statements are also available providing a unique perspective on each of the artists involved and their interpretation of The Golden Rule - a clarion call for peace and understanding in our time. Resources following the interfaith curriculum framework which outline core similarities between belief systems as part of intercultural understanding. With 8 faith groups described in detail, these resources were created for the Golden Rule Exhibition (2016) but are suitable as general curriculum resources. A set of pages with the collected resources for each faith group, including the quotes, video of the artists talking about the Golden Rule and their work, and stories which involve their faith and other faith groups working together. A fabulous resource for reflecting on interfaith co-operation religion, ethics, as well as art. 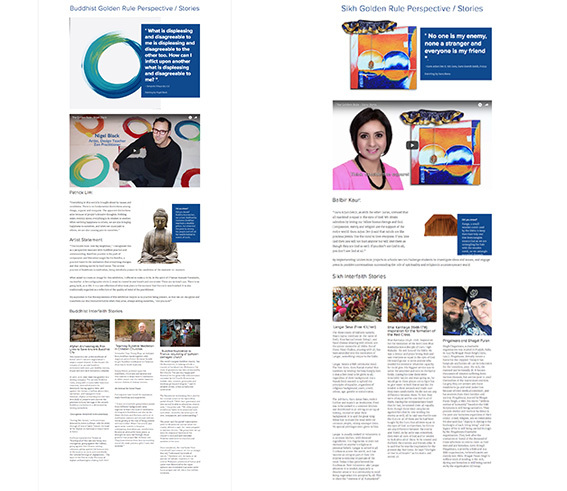 The Golden Rule Verses and expert commentary can be found integrated with other content on the Art and interfaith Stories page, or alternatively you can dowload the original exhibition leaflet as a PDF here. The Golden Rule Interfaith Art Exhibition was proudly supported by the Australian Government and the City of Adelaide.